American Brooks Koepka has been a pro for less than three years, but has already won more trophies than during his four-year career at Florida State. His professional titles have come in Spain (twice), Italy, Scotland and Turkey. The Florida native has finally earned his first win on home soil on Sunday, claiming the Waste Management Phoenix Open by one shot over Bubba Watson, Ryan Palmer and Hideki Matsuyama. 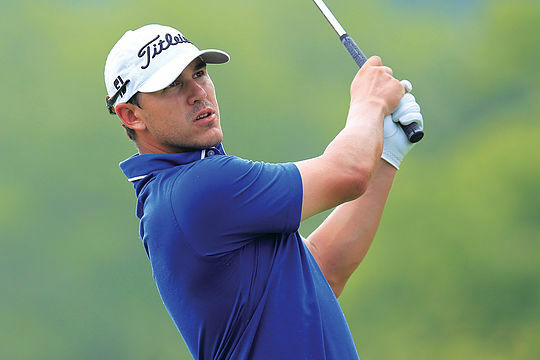 Koepka’s circuitous route as a professional has been well-documented. He won three times during his All-American career in college, but headed to Europe because it was the only place where he could get starts when he turned pro in 2012. He also won four times in 2012 and 2013 on the European Challenge Tour, then won his first European Tour title in November at the Turkish Airlines Open. The Phoenix Open was his sixth professional win. He took a step in that direction Sunday with his first PGA TOUR title. He’s now number six in the FedExCup Series and will make a big move in the Official World Golf Ranking (he began the week at No. 33). He has finished in the top 10 in all three of his PGA TOUR starts this season. Koepka shot a final-round 66 on Sunday at TPC Scottsdale to finish at 15-under 269. He started the final round three shots behind Scotland’s Martin Laird, and was four shots behind after making par on the first five holes. He made birdie on Nos. 6 and 7, but didn’t make another one until the par-5 13th. Then he holed a monster 51-foot eagle putt from off the green at the par-5 15th. He was tied with Laird after 15 holes, but only needed to par in after Laird’s collapse. Laird made bogey on the drivable par-4 17th after hitting his tee shot well right of the green, then made double-bogey at the last hole after hitting his tee shot in the water. None of the runners-up could make birdie on the final three holes. “I wanted to come out this year, get a win, make the Presidents Cup team and further down the road make the Ryder Cup,” said Koepka, who finished fourth at last year’s U.S. Open.